Ok, I think we have our Mail Chimp issues resolved--I won't bore you with the details except to say there new integration of an outbound email screening software ROYALLY sucked. 3 phone calls and one conference call fixed the issue--we believe. For this updated September newsletter I am going to chop it into smaller bites this week to be sure. OK--to riff on Robert Logia's character in "Scarface"--"The biggest problem we have now is what do we do with ALL that cash!" Yes in 2018 we have taken up to 615% in profits by selling 11 positions. Look I never forget you have REAL money at risk in this now 10-year bull market--and protecting our giant profits (still averaging 55.3+% per year since 2013) means we have sold (and will sell or trim) ANY position when we have overweight profits and/or the transformational growth wave has peaked or it hits our price target (and actually sell 50% when it gets within 10% of our price target! Also as I will get into I have NOT been willing to add new positions in our favored Super Sectors like Enterprise Cloud Platformity stocks (Enterprise Digital Platformity is my name for cloud-based business process and operations vertical application software) because of their ginormous valuations. Today's bloodbath in our Platformity Watch List with write-down on Mongo, Stichfit, and others tell me these stocks are great top-line growers but there are now 50-60 IPOs in this space: It's time to separate the truly great players ( like Adobe, Salesforce and few others) that have hit critical mass in huge TAM ("total addressed market") spaces from the money-losing players that do not have high margin of safety/stickiness and a true path to real EPS and pricing power. On that list includes our favorites that do NOT compete with Amazon (that we are NOT chasing but waiting for next market meltdown): Splunk, GrubHub, Service Now, Yext, VMware, Zuora , VEEV, Yelp, DocuSign, Instructure, CDay, AVLR, DATA, AYX, HDP, PTC, CLDR and Palo Alto Networks. 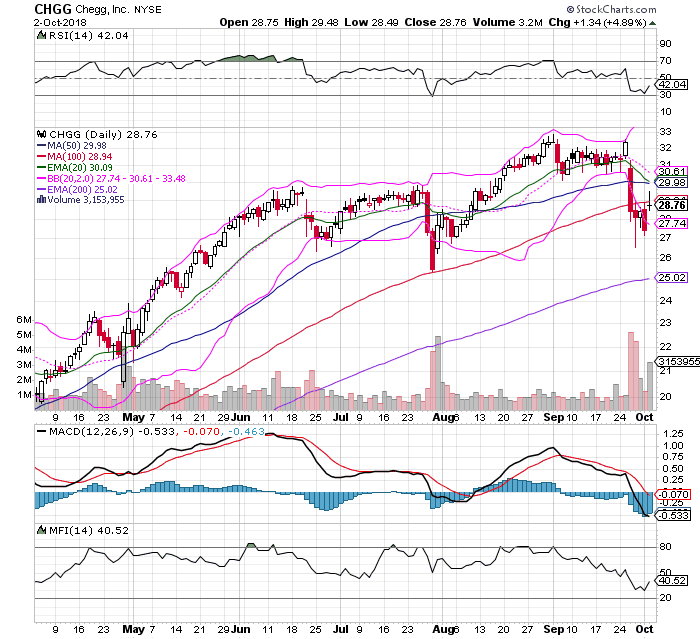 But we have one Consumer Platformity Play that got hit for a data breach last week that meant nothing--Cheeg, Inc. (CHGG) If you have a college student in your house of life, ask them about Chegg. Their business is simple: they substantially cut the cost of college books and supplies and they substantially help students get out in 4 years with a diploma. It's a $trillion addressed market and Chegg is the pure play with 40% topline growth and real cash flow with only 2.2 million students in their system. Again...Chegg operates in a trillion dollar a year industry, in which 44 million Americans have borrowed over $1.4 trillion to participate in a system--they have only 5% of students on their platform with little competition. And now the company has gone 100% digital in order to meet digital only students' learning needs both in the U.S. and globally. Chegg's latest push has been to convert the company to an all-digital model. 2017 was its first year as an all-digital company, positioning it to be a high-growth, high-margin, more predictable business. By using an all-digital model, the company is better able to engage more users, as well as engage its users in a deeper way. For the full year of 2017, Chegg Services subscribers grew 45% to a record 2.2 million, including 47% growth in Q4 alone, according to management. Chegg Services revenue grew 44% and more than doubled its adjusted EBITDA from 2016. Chegg Study now includes nearly 7 million textbook solutions ( digital books or used) from 28,000 ISBNs, and more than 13 million unique questions that have been asked by students and answered by its network of over 35,000 experts, according to management. Moreover, the company is continuing to invest in key areas of growth where students need access. In recent quarters, Chegg acquired Math 42, which is expected to expand its coverage of math significantly in 2018. Chegg also continues to invest in careers services, as over 70% of students say they go to college to get a job, according to the company. Education is a recession-proof industry, and in many ways, education increases during periods of economic hardship as many go back to school to either sharpen or learn new skills. Students have become increasingly dependent on online, personalized, learning that is more convenient, more affordable, and more relevant to improve their outcomes. Chegg cannot yet keep up with just current demand but its efforts are gaining traction due to its growth in both subscribers and revenue. As the company becomes more efficient in its all-digital platform, they are tucking in SaaS start-up that will not hit critical mass BUT can be made profitable under the Chegg platform. We forecast earnings growing 40-45% for next 8-10 quarters, leading the share price much higher. ﻿In short, these stocks have been a game of chicken to see who blinks first--and valuations based on big multiples of just top-line growth alone are just not sustainable. The first rule I learned on Wall Street in 1980--its' the moves you don't make that make you the most money. Many times you make the most money by NOT doing something vs. chasing something or just betting on price momentum continuing forever. The other lesson? When the price momentum trade ends in a stock (meaning the traders are buying because it's going up and when it quits going up they bail--see AMD!). What's Left In Our Portfolio with @75% Cash? We sold two $10,000 AMD overweight positions out of $30,000 total September 10--sold at $28 with a cost basis of $4.25 and $5.25 respectively (not including option premium or put options we also earned on these positions). The first $10,000 created a $60,888 profit on our first position (2500 shares) 6-to-1 and the second 2000 shares created a $46,000 return on $10,000 invested or 4.6-to-1. Our last position entered at $10.35 1,000 shares is worth $28,887. Update on AMD--Intel is fighting back on losing market share with their 10nm chips. The surprising tightness in lower-end CPUs for news desktop and laptop PCs (undoubtedly helped by US corporate tax cuts) caught Intel by surprise (and in turn hit Micron since every CPU or GPU for that matter is sold with a large amount of core OS DRAM as well.) The tight supply of Intel CPUs hurt Micron sales and created the surplus in the DRAM memory market that led to the exit of our two Micron (MU) positions. Intel provided a supply update last Friday that includes news they are making "material" progress with 10nm yields improving and increased volume production still expected in 2019. The 10nm delay has proven a tailwind for rival AMD of course which was down the news. Intel confirms that chip supplies are tight in part due to the “surprising return to PC TAM growth.” The company said they will prioritize production of Intel Xeon and Core processors and believes it has at least the supply to meet the FY revenue outlook. Action to Take: HOLD final AMD position and let's add another position at key support <$28 and as close to $26 as we can get .The ballistic 173% rise in the AMD from May to September was unsustainable--AMD was 2nd heaviest shorted S&P 500 stock next to Tesla and ahead of Netflix. We took our amazing profits after 50 months of patiently waiting with AMD--it was the right call. Our $40 target means we can make our minimum 25% annual return goal on a next tranche if we buy it opportunistically!. We sold our two Micron positions at $45 --800 shares at $13.25 cost and 1,100 shares with $9.20 cost. Those sales generated profits of $26,000 and $39,500 respectively. With the peak of the DRAM price rise and Intel tight CPU supply that was also the right call. We waited too long to pull the trigger of semi-equipment giants Applied Materials and Lam Research (again mea culpa) but still exited with an average 124% profit on our $20,000 combined investments in AMAT ($23.75 basis) and LRCX ($82.50 basis). They have also sunk much lower since we bought them. We also closed out our $40,000 ($10k each) in OLED $57.50 basis), CAVM ($62.50 basis) , Accelis ($20.25 basis) , ASML ($153 basis) and AAOI ($58 basis for $2690 loss) for a combined $28,562 profit on our $40k. All in, our $225,950 of profits on $100,000 invested or 226% return with an average holding period of 25 months earned us a little over 102% a year on our money. I know from subscribers there are new vacation homes, new boats, and most important earlier retirements from the $100+ million in profits we can assume our subscribers were made on those positions. THAT is what we do this for--to financially transform lives. Given the S&P 500 returned 15.474% annualized (I LOVE this S&P 500 calculator site--check out my math!) that means with these stocks alone we the 2-year return of the S&P 500 with realized profits by 6.6 times!. Considering you would have paid 2% management fee and 20% performance fee to the average hedge fund to return 8.9% in that same time frame--we are looking pretty good vs. doing nothing. What do we have left in our portfolio and buy under prices? NVDA $270 $400 Don't chase NVDA...it bounced under our $260 price and then boom added $30. Be patient starting or adding. NEWT $18 $22 Note: After a 550% return (including dividends) for our 2013 subscribers from their original $10,000 in October 2013, It's now trading above it's $20 net asset value NAV. IF YOU ARE A SHAREHOLDER from our original $4 buy-in and hold the $4.85 special dividend, you should NEVER sell your shares until we make a call for next recession. Even then--the $2.25 a share dividend is insanely high. We bought another bite at $10 on 2.20.16 as well. OK...that's it for today. Updated Super Sectors out tomorrow including AI/Machine Learning (AMD and NVDA already) , Robotic Labor Automation, Fintech, 5G Next-Gen Wireless Broadband, Internet of Things (IoT), Biotech Breakthroughs, CBD healthcare (Cannabidiol pharma--the non-psychoactive ingredient in cannabis and hemp) and always profitable Corporate Transformations/Pivots and New Transformational Consumer brands. Let's face reality--the 600-800% mega winners 10-years into this bull market are few. Our goal is to keep our 55.3% annual growth streak going until 2020 and BUILD our 20%+ YIeld Portfolio w/Dividend Reinvestment to be ready for the next recession--and have enough cash to make ANOTHER killing like 2009-2010!